VAST, short for Vector Alignment Search Tool, is a computer algorithm developed at NCBI and used to identify similar protein 3-dimensional structures ("similar structures") by purely geometric criteria, and to identify distant homologs that cannot be recognized by sequence comparison. or 3D domains The original VAST finds structures that are 3D similar to individual protein molecules, or individual 3D domains. The original-style VAST display can be viewed by clicking on the "Original VAST" button on any VAST+ search results page. 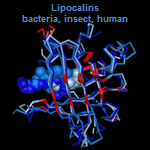 The original VAST help document provides an illustrated examples of original style VAST search results, alignment footprints, and an example 3D superposition of lipocalins from bacteria, insect, and human. The VAST+ help document provides illustrated examples of the newer VAST+ search results, where you can see the "Original VAST" button near the upper right corner of each illustration, and summarizes the difference between VAST and VAST+. Publications provide additional details about both. macromolecular complexes An enhanced resource, VAST+, finds structures that are 3D similar to your query structure's macromolecular complex (biological unit). The search form in the "Retrieve pre-computed results" section of this page, below, will retrieve VAST+ results for the query structure that you specify. 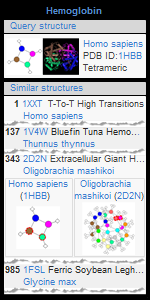 The VAST+ help document provides illustrated examples of VAST+ search results, featuring similar structures for glutamate dehydrogenase (Thermotoga maritima) and deoxyhemoglobin (Homo sapiens). The help document also describes the difference between VAST and VAST+. VAST and VAST+ are applied on every protein in the Molecular Modeling Database (MMDB) during MMDB data processing in order to identify similar 3D structures. To retrieve the pre-computed results, follow the "Similar Structures" link on a structure's summary page, or simply enter your query structure's MMDB ID or PDB ID below and press "GO." The new style VAST+ results are displayed by default. Illustrated examples of VAST + search results are available in VAST+ help document and in the thumbnail to the right. If you prefer to view the original style VAST display, click on the "Original VAST" button on any VAST+ search results page. Read more about the difference between VAST and VAST+. (PDB formatted file) If you have a newly resolved protein structure that is not yet in MMDB, you can use the VAST Search service to input your data in PDB file format and compare your structure against all those in MMDB in order to find 3D similar structures. The VAST Search Help document provides additional information about using the VAST Search page. 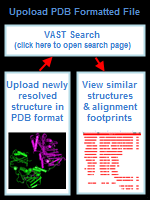 Please note that, at this time, VAST Search still returns results in the original-style VAST display, which lists structures that have similarities to individual protein molecules and 3D domains in your query structure, and allows you to view their sequence alignments and 3D superpositions. The new VAST+ search results, which rank similar structures based on their biological unit similarity to the query structure, and provide the ability to view sequence alignments and superpositions of the biological units, are currently calculated only for structures that are available in the public database. and superpositions Whether you retrieve the original VAST similar structures from the summary page of a publicly available structure, or through a VAST Search, you can then use the free Cn3D structure viewing program to view a superposition of the query structure and similar structures, as shown in the illustrated example of lipocalins from bacteria, insects, and human that appears in the original VAST help document. Click on that illustration to open the interactive 3D alignment in the free Cn3D program. Please note that Cn3D 4.3.1 must be installed in your computer in order for the file to open. The Cn3D Tutorial provides additional details about viewing structure alignments in Cn3D. Note: When you retrieve similar structures using VAST+, rather than the original VAST, the 3D superpositions will open automatically in iCn3D, NCBI's web-based structure viewer, without the need to download/install a separate application.